Transition Chicago is growing a local network of initiatives and experimenting with what it means to engage a big city in Transition. Guest post by Naresh Giangrande - read more. Joanne Poyourow of Transition Los Angeles writes about navigating livelihoods in changing times in her recent blog post. Read more. Over 25 Transition Initatives and groups came together in Richmond, CA to share their experiences and connect the dots across the region. Read more. Connecting across generations and getting to know grains in California > Transition Culver City held a special skillsharing workshop this month exploring baking 101, with seasoned bakers and beginners alike: "Lots of fun grinding our own flour from wheat berries, brown rice and almonds. We learned about vegan baking and gluten-free flour mixtures." Delicious hands-on learning. Transition Santa Cruz is taking a stand and endorsing Proposition 37 which will require labeling of genetically engineered foods sold in grocery stores. "Transition Santa Cruz occassionally takes a stand on political issues when their meaning and impact is of particularly strong relevance to our mission of relocalization. Proposition 37 is one of those issues...In keeping with our mission to be a catalyst for relocalization — including the development of local self-reliance in food, energy, and economy — Transition Santa Cruz endorses Proposition 37...We believe that affording people the right to know whether their food is genetically engineered is in keeping with the following Transition Santa Cruz values: relocalization, community regeneration and sustainability" read more. 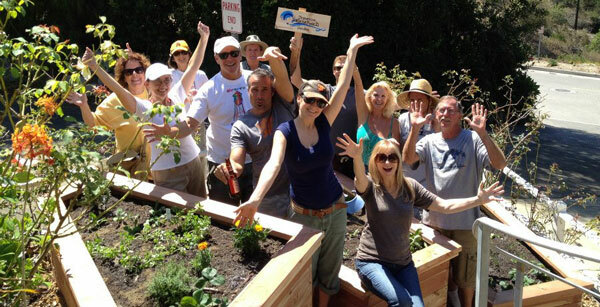 Meanwhile, Transition Laguna Beach is continuing their garden installations from homes to schools to churches and recently held their annual Harvest Celebration in collaboration with local businesses and organizations. Talking Transition on TV in Michigan > The Ann Arbor Reskilling Festival has been running successfully for the past few years -- one of the organizers Barbara Lucas recently did an interview on the Transition theme for a local TV show. Over in Cadillac, Transition Cadillac held their 2nd Annual Transition Cadillac Area Harvest Celebration Fun(d)-Raising Dinner & OOOOBY (Out Of Our Own Backyards) Potluckand are getting set for their "Good Grief Gardening Debrief" to wrap up the garden season, reflect on lessons learned and get ready for the next one. Fixing the Future on tour in New Hampshire > The Transition Keene Taskforce joined with other businesses, nonprofits and community initiatives to bring the Fixing the Future Across America Event to the Monadnock Region on October 17 at the local theatre with a special guest panel including Bill McKibben and Majora Carter. "Over sixty cities and towns nationwide have hosted a screening of the documentary Fixing the Future to spur action toward strengthening local economies." Read more. Growing community health initiatives in Oklahoma: "Transition OKC volunteers worked through the chilly temperatures delivering giveaways and information to families about nutrition, gardening, and the deliciousness of healthy quiches!...This past Sunday at the inaugural OK 5210 event, Transition OKC gave away almost 500 chard plants, mini-chard quiches and recipe and growing guideline cards to an amazing array of wonderful, friendly people learning how to live healthy." Moving forward on solar and sustainability in Pennsylvania > Transition PGH held their 9th Sustainability Salon, in conjunction with the PennFuture Solar Tour, part of an ongoing series of "monthly enviro-conversational gatherings with potluck food and homemade music." Following their rousing discussions on solar power, food, trees and park stewardship, alternative energy and climate policy, and regional watershed issues, this month they welcomed participants of PennFuture's regional Solar Tour as well as Sustainability Salon regulars. Exploring smart energy at home in Texas > The Energy Action Group of Transition Houstonhas arranged for a special tour of the Reliant Smart Home! "This is a house that has been equipped with devices and charging stations that interact with the smart meter to provide more efficient use of electricity. There are also energy efficiency and conservation upgrades that will be of great interest." Read more. Community bartering and cider pressing in Washington > Sustainable NE Seattle's fourth annual Barter Fair was another success, delighting young and old despite the rain. Photos by Leo Brodie. This weekend they'll be creating the space to house their new tool library: "We'll be hauling out trash, scraping loose exterior paint and priming...Let's see how many hands can make light work of this project!" Check out the tool library website to learn more about this exciting Sustainable NE Seattle project - http://neseattletoollibrary.org. Submit your news to be included in the next roundup! email stories@transitionus.org.